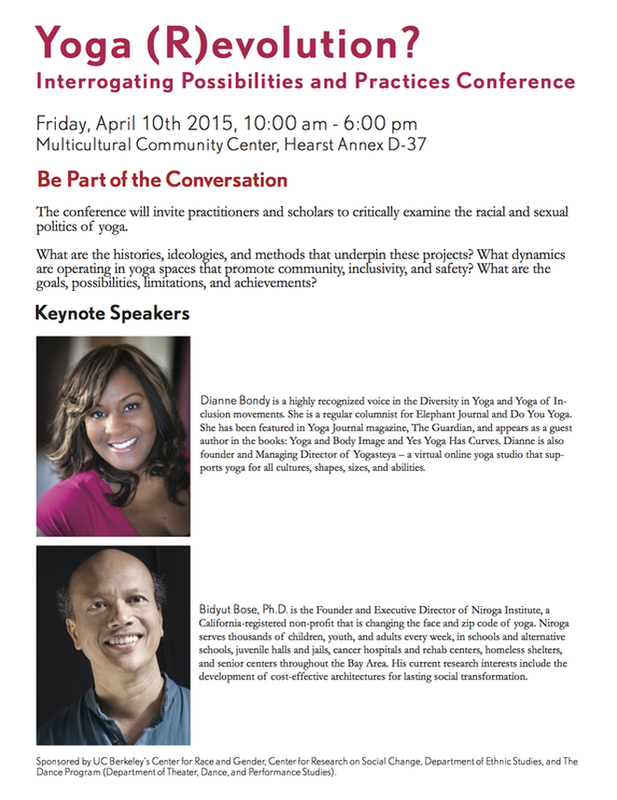 Speaking Event: Berkeley on Friday 4/10! Hi everyone! I’ll be presenting some of my research from my dissertation on yoga this Friday, April 10th in Berkeley, CA at the second annual conference held by the Race and Yoga Working Group. The theme this year is Yoga (R? )evolution and Dianne Bondy is going to be one of the keynote speakers. (Can’t wait! I have huge respect for her.) For my presentation I’ll be talking about the feminization of yoga in the 1980s. And good news! If you are in the area and want to attend the event is free to the public. Last year I was lucky enough to be a speaker at the first annual conference, and it was a great event. I’d highly recommend checking it out if you can! The twenty-first century yoga body is often portrayed as lithe, young, white, affluent, female, and bent into seemingly effortless advanced physical yoga postures with grace and poise. But how did this body and its particular type of movement patterns become representative of yoga in America and, increasingly, throughout the world? Traditionally, yoga was exclusively practiced by men, and up until the 1980s remained a male-dominated field even in the United States. However, by the late 1980s a marked shift began in the gender composition of yogis as well as the gender dominance in the field. Yoga became feminized and increasingly stereotyped as a feminine activity and movement pattern. This paper traces the gender transformation of yoga in the USA from a male-dominated practice to a feminizing and feminine activity. Some background information on the historical precedent of men in yoga is provided followed by a discussion of the feminization of yoga that occurred during the 1980s and into the 1990s. I explain the causes for the dual process of why men increasingly opted out of yoga while at the same time women increasingly opted in, eventually producing a highly polarized demographic group of female yoga practitioners and a dominant cultural understanding of the “authentic” yoga body as female-identified. Finally, I discuss the implications this has on recent efforts by the yoga community to bring men back into yoga. I was thinking yesterday about what it would mean to create innovative yoga classes. If I completely abandoned my preconceptions of what a “class” should look like, and how we should learn things (the traditional drill style–historically Western, White, and Capitalist), what would a yoga class look like? How can we really teach yoga, the practice, rather than yoga, the exercise routine? What is the best way to educate someone on the essence of yoga? We’ve become so caught up our ideas of what a yoga class is, and how to teach yoga, and what the best way to learn is that we lose sight of the essence of the thing we are trying to teach. Yoga has not always been taught in the way we teach it now. The “standard” lecture or drill format of classes became popular only once yoga had become Westernized during colonialism with the influence of trends like Swedish gymnastics or military drill training among armed forces (see Singleton’s excellent book for more on this topic). But now we consider it normal to teach to a class of people, all of different levels, leading them through a set sequence where the teacher may (or may not) offer variations or adjustments, let alone individual attention to correct a student’s alignment or help lead a student deeper into a pose. I feel like in some ways even private yoga classes have become formulaic. But how often do we actually stop and think about what format, what sequences, what poses, what words, what “homework”, would really get to the heart of yoga and allow students to experience that rather than a nicely packaged and marketed form of exercise? Not every thing can be taught in the same way. Often in Western-style teaching systems (including the Westernized style of yoga teaching that has become popular in the last few decades) we expect someone to be able to regurgitate exactly what we say, in the exact words we say it (Follow this sequence! Focus on these things!) that we forget that route memorization doesn’t reflect actual understanding. When someone understands something they are able to make it their own, to personalize it, to be creative with it, to recognize what is most important and retain those things while deviating within set lines. Understanding something deeply allows for the “regulated improvisation” of social actors because they are able to reinterpret and build on the material they have learned. Simply being able to repeat something doesn’t mean you understand it. Understanding allows for innovative solutions and problem solving; route memorization doesn’t. Only with understanding can you have innovation, because innovation is ultimately about seeing the connections between things, understanding what things are similar and what are not, and how things will interact if they are combined. As Tom Freston said, “Innovation is taking two things that already exist and putting them together in a new way.” Innovation is the application of pressure in such a way that you affect great change with little effort because you are able to anticipate and influence the course of future events by understanding the factors at work deeply. To quote a great article from the Washington Post, “Innovation is not simply a technical matter but rather one of understanding how people and societies work, what they need and want.” So we have to learn to understand, not to simply to memorize. Memorization produces replication, not innovation. Innovation requires seeing and actualizing the unimaginable, and the only way to do that is by imagining what doesn’t exist, by changing our entire worldview in a radical and profound way. The quote I started this article with from J. K. Rowling is exactly about this; how by using our imaginations we have the capacity to radically shift how we see the world and what we think is possible, to imagine better worlds and better futures. Ultimately imagination is the root of all empathy–the ability to imagine ourselves in someone else’s situation. That’s a transformative power, just like yoga is a transformative practice. You have to have a vision of where you are going to get there, otherwise you never grow and change. To become better people and better societies we have to grow and change and innovate in our own lives. We have to understand ourselves and the world around us so we are capable of imagining a world and self that retains the things that we love but also improves upon them. This has been one of the deepest and most profound lessons I’ve learned through yoga; that I can constantly improve myself, but that it takes a deep awareness of my existing patterns and habits and the ability to imagine who I want to become, so I can recognize when I am falling into the trap of a pattern and redirect into an innovative solution. Within yoga we often fall into the same patterns and habits, teaching yoga through replication and memorization rather than encouraging deeper understanding in our students. Classes are usually a one-time experience of following instructions students don’t fully comprehend and that may never be fully explained. Even private classes can often fall into a similar trap of using standard formats focusing on surface level “assignments” like doing a particular sequence of poses so many times a week. (But why those poses? Why that many times a week? Why in that sequence?). Students often aren’t able to innovate in their yoga practice because they aren’t given a firm basis of knowledge to build on; in standard classes we aren’t taught to approach yoga as a way of life or a practice (at least until more advanced training like teacher certification programs, yet even these are highly structured and only teach institutionally approved yoga knowledge). I think this is why it’s so hard for many yogis who have only taken drill-style group classes to begin a home practice, which requires changing the way we think about yoga and how we do yoga from the dominant Western pattern of teaching (just follow the instructions) to something you work on, practice, and play with as you explore what you’ve learned on your own, with no lead instruction, and no set sequence already predetermined for you. Yoga isn’t always beautifully choreographed into a sequence of predetermined poses; once you transition to a home practice you begin to realize that yoga is in fact messy and full of awkward, silly, and embarrassing moments. It’s something you work on. It’s also full of pleasureful, peaceful, and triumphant moments too. But recognizing that yoga is in fact a practice is a radical, paradigm shift, and one I’m still working on learning to find joy and pleasure in and motivation for. A home practice helps you realize all the backstage work instructors do behind the scenes to present and teach the beautiful, fun, choreographed facade of “what yoga is.” But the facade isn’t substantive and rarely teaches the underlying practice; it doesn’t reflect the true essence of yoga. So let’s return to the questions I started this post with. If I completely abandoned my preconceptions of what a “class” should look like, and how we should learn things (the traditional drill style–historically Western, White, and Capitalist), what would a yoga class look like? How can we really teach yoga, the practice, rather than yoga, the exercise routine? What is the best way to educate someone on the essence of yoga? I’m not entirely sure the best answers to these questions, but I’ll share some of my ideas to get the dialogue going. Utilize a variety of instruction formats. I think it’s important not just to teach (or learn) one way. We can get at multiple viewpoints by utilizing different formats for our teaching and learning methods. We can learn a great deal about sequencing from taking (and teaching) choreographed sequences of poses. And sometimes we can learn about poses through sequencing, particularly by building towards a more complicated pose by practicing poses that are part of the complex pose in a sequence which leads up to the peak challenge pose. But we can also learn a great deal from one-on-one instruction, from exploring one pose in depth using a workshop format, from playing around practicing with other yogis using no particular structure or format (hey, what you are doing looks like it would be fun, want to show me how? ), from writings on yoga, or from talks about yoga. Utilize technology to help students learn. Technology can also be a powerful way to connect with more students. For example, utilizing video chats to teach yogis in other parts of the world (online privates or online small group classes) can allow students to connect to teachers regardless of where they live, something particularly valuable for both the student who may not have local access to a yoga instructor they like and the teacher seeking to build their business. Technology like social media can also be a great way to build a community of students that are all able to support one another and for students to learn more about their instructors and connect beyond the classroom. Being involved in social media is in many ways required in today’s yoga world, since it is often the way to build a large student base and create a more steady income flow through strategies like workshops, retreats, or online programs available for download to students (a great example of this is the Codyapp website). I think sometimes we are either afraid or don’t even consider teaching why we do something a particular way. We shouldn’t shy away from explaining the why to our students, including things like why these poses, why this order, why this pace, why this alignment, why practice this length of time, why this meditation, why this adjustment. Knowing why is empowering and allows students to understand what they are doing on a deeper level, and subsequently make it their own, innovate, and be creative in their practice, as well as develop a home practice based on a sound knowledge of yoga. Many students want to deepen their practices yet struggle with having the knowledge they need to do so. Give it to them, or provide them with a resource they can use to learn about it on their own. Teaching why can also help us realize our own preconceptions and deepen our own knowledge when as teachers we realize we don’t even know why we do something a particular way. Talk (and read) about yoga. I think so often we forget that it takes talking with other people for us to think through things and come to our own conclusions. Narration is a powerful way for us to come to know something; sometimes we need to explore something verbally for it to become clear for us, so having space to dialogue about yoga, ask questions, think about what you have learned beyond just the physical exercise practice is important. Many students can benefit simply from talking about the practice, what the practice means to different yogis, what people have written about yoga, what types of insights we can gain from yoga, what certain yogic ideas mean. Similarly, reading about yoga can profoundly deepen our understanding of yoga as well (as both teachers and students). Encourage students to be self-reflexive. Without having any expectations, encourage students to think on and share what they have learned from a particular lesson or practice. In other words, encourage students to be self-reflexive about their practice and allow them to learn from their own experiences rather than interpreting those experiences for them. This can also help develop body awareness and mindfulness in other areas of their life. Make yoga pleasurable and fun. Encourage students to move from a place of pleasure and joy, to explore how their own bodies like to move, to become aware of their body signals, and to have fun with the process of yoga and worry less about looking perfectly choreographed and graceful all the time. Be willing to have fun with yoga in addition to the more serious meditative movement. Practice moving within poses, then practice stillness. Many times students don’t have body awareness of what proper alignment is. Standard classes often focus on holding a pose in stillness or on moving in only one direction within a pose for several breaths before transitioning to a different posture, but both of these methods can be limiting. Many times this type of queuing is a result of the quick pace that has become popular in most yoga class and/or teachers perpetuating instructions they heard from their own teachers or in their teacher trainings. Many teachers go too quickly for students to become deeply aware of their alignment in a pose, or they only plan to do a pose once in a sequence so there is no opportunity for students to repeat and build on the first appearance of the posture. For example, in warrior II we often encourage students to drop down deeper in the legs while holding the upper body in stillness. But when we fall into this trap of teaching using a “normal format” we may completely ignore encouraging students to move their upper body in ways that help them achieve (and understand) proper, neutral, and open alignment throughout the spine and shoulders. We may also completely ignore how much weight is being held in each leg, and many students often place too much weight towards the front rather than creating a balance between the effort of the front and back leg. It is empowering to explore poses by moving within them in ways that help students discover body awareness and find neutral alignment for their bodies, and helps students uncover the why behind the pose. So for warrior II, maybe you can encourage your students to pull their upper body back (towards a reverse warrior) and then forward (towards extended side angle) while opening the shoulders, repeating that motion until they are able to locate their neutral spine and a feeling of openness in their shoulders and chest. Or encourage them to shift their weight more toward the front leg and then more toward the back leg until they are able to sense a balance in effort, and then drop down deeper in the legs. Once they are able to find their neutral position, only then encourage stillness. Stillness without exploration can miss the point of an entire pose. What we need is to move within poses until we find the point where being still becomes a practice in meditation, playing with our edge, and proper alignment and body awareness.